This cosy Coach House has a mezzanine double bedroom overlooking a lovely, alcove-lit, sitting room with a wood burning stove. A moments walk from the breathtaking Dunworley Beach. The perfect couple's (or small family) nest on the Wild Atlantic Way! The coach house sleeps 2/3 people but extra accommodation is available in our other cottage. Please see below for more information on this. A romantic mezzanine double bedroom with a king size sleigh bed overlooks a lovely, alcove-lit, sitting room with a wood burning stove. Beside the charming sitting room area is the kitchen. Through the next door is the bathroom, complete with a big glass-doored shower. Outside your charming split coach house doors is a terrace with outdoor garden furniture. Down a few steps is a beautiful sunken garden. The duvets & pillows are all feather & down. 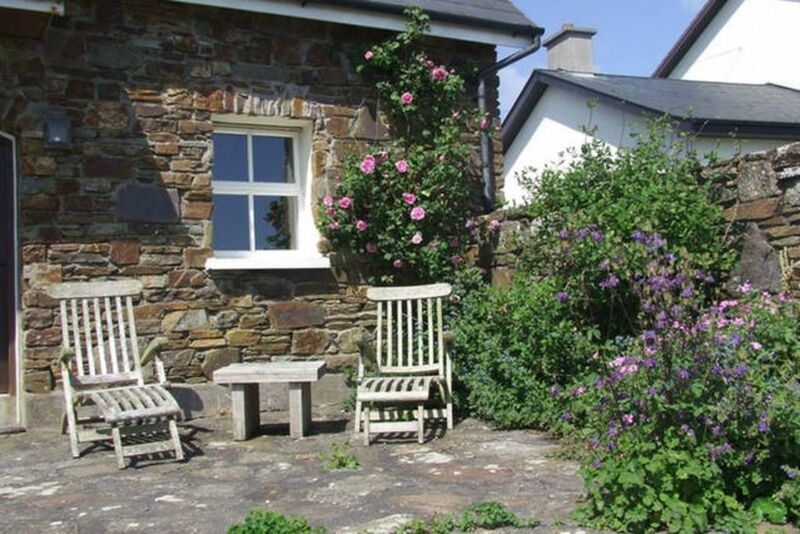 For those who can’t totally embrace the seclusion of wild West Cork, we have WIFI set up in the coach house free of charge so you can keep in touch with the outside world! We can serve food in the comfort of the Coach House. For extra accommodation we also have a cottage which sleeps between 7 - 10 people (VRBO Listing 42425). This can be booked at an extra cost. Wonderful wood burning stove keeps the coach house cosy! Wonderful old VHS tapes for a retro throwback! This is a fabulous getaway. It's way out there. Subsequently, the energy is relaxing and the view is pristine. The cows were entertaining and happy. The cottage is very comfortable. We drove around in the area quite a bit. When we return, we intend to spend more time in the immediate area (walking, etc.). Having a nice fire burning when we arrived (twice) was such a treat!) Thanks Gilly and Richard. Lovely cottage, had an amazing time and location was beautiful! Incredible location, beautiful cottage, wonderful folks! We came to Ireland for our 20 year anniversary and this was THE highlight of our 10 day trip. The cottage was cozy, beautiful and quiet - and remote (which we LOVED). Gilly and Richard were amazing hosts, providing an educational and fun tour of their farm (dogs, chickens and all), recommendations of hikes and places to eat in the local towns, and a dinner and breakfast that my wife and I agreed were the two best meals we had on our trip. The location was also great, with a stunning beach just a few minutes walk from the front door, and a number of local hikes that were long and relaxing. Overall, there is not one thing that I can critique about our stay. Thank you Gilly and Richard for making our anniversary! A charming little cottage in a stunning location. Very private. Both the cottage and the setting exceeded our expectations. Dunworley Beach, the surrounding countryside, and the nearby towns of Timoleague and Clonakilty offer ample opportunities for exploration and discovery. We had a wonderful adventure following the Seven Heads Peninsula hiking trail on our bicycles. We learned of it from the sign on the grounds of Timoleague Abbey. For those who prefer not to hoist bicycles over fences and up staircases, the trail would be brilliant on foot as well. . .
Gilly and Richard were friendly and welcoming without being overbearing, and the time we spent just relaxing in the cottage or eating breakfast on the patio was lovely. Everything you could want ... plus cows! The Coach House was a perfect spot for us. It's comfortable, and clean, and from there, you can easily access many, many beautiful spots in the area. Walking to the beach is easy and a must. Or ... as we did on a couple of days, sitting on the patio with a coffee or a beer, all while watching the cows next door (who, in their curiosity, often come up to see what you're up to) is very relaxing. I'd come back here in a heartbeat. We loved it. Just beautiful... the perfect get-away! It was with much anticipation that we arrived at Dunworley Cottage for part of our 12 night stay in Ireland and it did not disappoint! Rich greeted us on arrival and acquainted us with the cottage leaving us to settle in and enjoy the coal fire he’d prepared for us. The cottage was spotless and really felt like home. From the beautiful countryside outside our windows to Dunworley Bay awaiting at the end of the driveway there was no lack of gorgeous views!! I loved having breakfast and coffee on the patio in the mornings, exploring the beach with its fantastic caves while rock collecting in the afternoon and warming up by the fire in the evenings. Rich recommended a beautiful hiking path for us and we got to meet Gilly when she brought us some fresh radishes from their garden - she was a delight! These were in addition to the fresh eggs, milk, butter and salad greens that awaited us on our arrival. Our two nights here were the most relaxing of our trip and I only wish we’d been able to stay one more night! Highly, highly recommended!! !